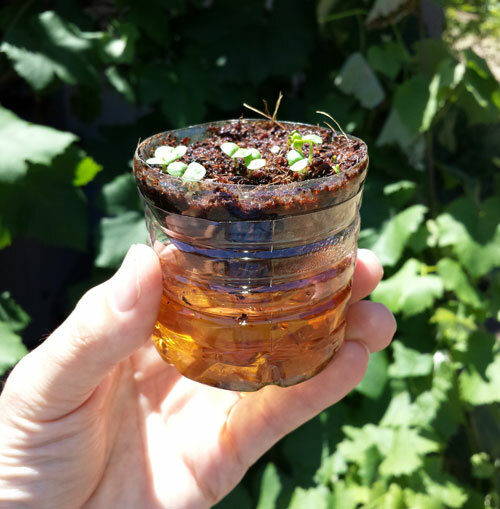 Here’s a simple way to get started with hydroponic growing, and a bit of recycling as well. 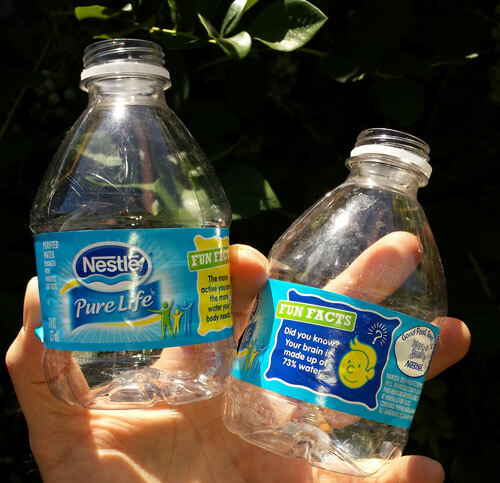 You can use water bottles as simple, disposable hydroponics containers by simply cutting off the top, turning it over, and inserting it in it’s own base. They sit nicely in a window sill and don’t’ require watering that often. The results are amazingly good. Start with some water bottles. We’ve used the mini bottles for this example. Cut the top off, turn it upside down, and put it in it’s own base. Fill it with coco coir (more on that below) and put some water in the base. Plant some seeds, basil in this case, and put it in a sunny window. The really nice thing about this system is that you don’t have to water your seedlings that often since they can wick water up from the base and stay perfectly wet while sprouting. The real trick here is to use the right soil and the right food. If you’ve never used coco coir before then this will be a fun experience. 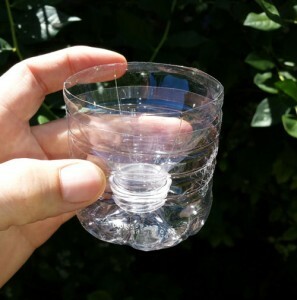 It comes in a compressed brick that you soak in water and it expands 5-10x in size. Coco coir is a really great growing media because it holds water well and it let’s the roots breath nicely. There are many brands available and I’ve found them all equally good. I’ve linked some General Hydroponics here, but really any brand should work well. 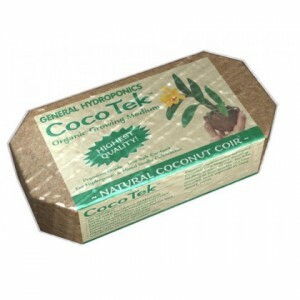 When you get the coco coir from the store it will be in a compressed brick. Break off a chunk if you only want to use a little bit and put it in a container of water like a bucket or a large bowl. Give it some time to soak up the water and expand. To use it simply take a large handful and squeeze all the water out. You’ll be left with a nice ball of soft soil ready to plant in. Since you are growing in coir and not soil you’re going to have to feed your plants. When you grow without soil you must use a hydroponic compatible fertilizer. In hydroponic growing fertilizers are usually referred to as nutrients, or just “nutes”. Do not use any sort of house plant food like Miracle Grow. Regular fertilizer requires soil to break them down for plants to use. Hydroponic nutes are available from the plant as soon as you provide them. This stuff, Pure Blend Pro Grow, has been one of my all time favorites. It’s easy to use, clean smelling, and very effective. 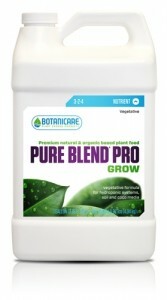 I like to mix up my Pure Blend Pro in either a quart or pint sized container and then put it on the shelf to use later when watering. I usually mix up some 1/2 strength to for new seedlings and only feed them once in the first month. After that most plants get full strength each watering. 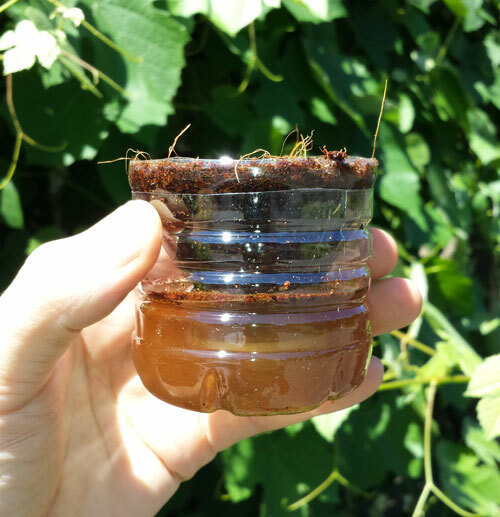 When growing with the water bottle method and coco coir you can wait a few weeks before the first feeding. After that simply put the mix up nutes in the bottom of the water bottle and let the coco coir wick it up.